As you can see, there are changes to your Back Office. Introducing our Questionnaire Dashboard. 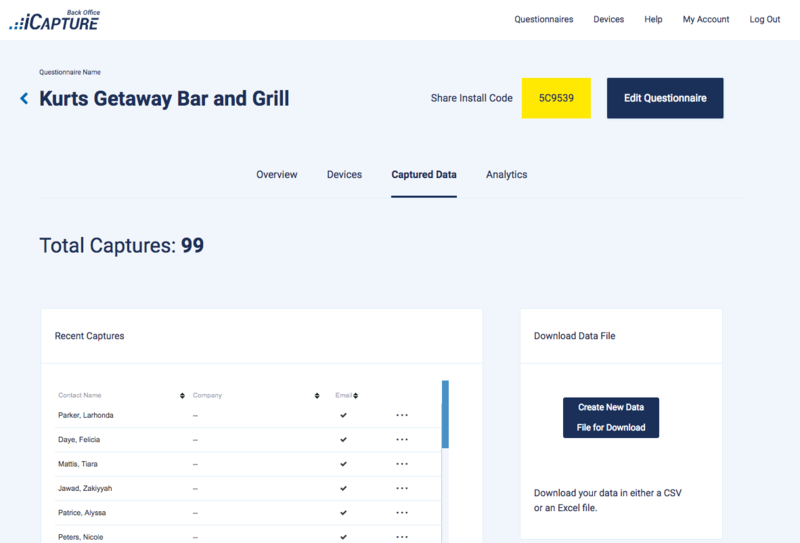 The Overview is designed to give you an at-a-glance look at all of your created questionnaires. Any questionnaires still requiring action to set up will have a red button with the action described (ex. Make a Test Capture, Install to devices, etc). To access a questionnaire, click on the questionnaires' title. The Questionnaire Overview shows information at-a-glance for captured data, auto reply emails, and integrations. When using a questionnaire, it’s important to make sure that everything is working properly. 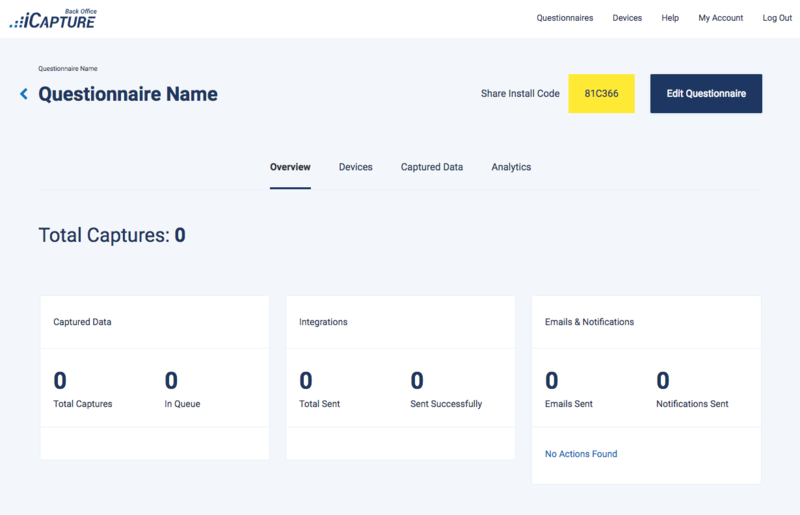 On the Questionnaire Overview page we display all information: number of captures, status of your integrations, number of auto-reply emails and notifications sent. Click Edit Questionnaire if you need to make changes or update your questionnaire and install on devices when you are ready. After capturing with the questionnaire, you should access the Questionnaire Overview to see if there are any awaiting actions that need to be taken or errors to take care of. If everything is okay, the next step is to preview captures. We have added a new feature to let you preview captures. Click on icon to see contact details and lead qualifying data. This allows you to see review captured data without having to download the spreadsheet every time. You can also delete test captures when previewing a capture! This is just the beginning of our Back Office improvements! More will come soon. Let us know if you have any questions or need assistance. We really value your feedback and are looking forward to hearing from you.